Vegas didn’t have a 1st round pick last year, they don’t intend on that being the case this year. Historically, George McPhee is active around the trade deadline. 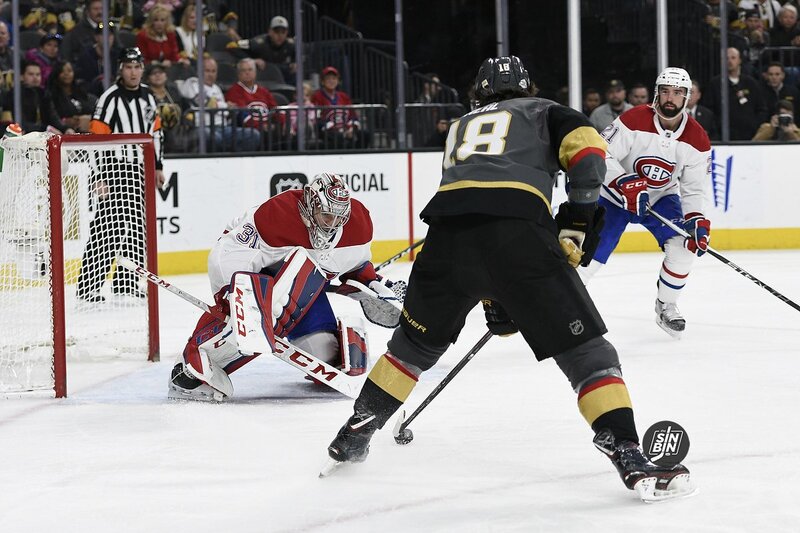 Whether his team is good and he’s buying reinforcements (like he did last year in Vegas) or if he’s bad and selling for the future, McPhee normally takes advantage of the closing of the marketplace at the end of February. In his 17 years in Washington, McPhee made a move at the deadline (within three days) in 15 of the 17 years. Last year, McPhee pulled off three deadline trades, adding Tomas Tatar and Ryan Reaves and moving on from Brendan Leipsic making it 16 of 18 seasons at the helm he’s swung a deadline deal. However, he’s in a bit of a bind this year in regards to future assets. Appearing on the Golden Knights official podcast, The Creator mentioned an unwillingness to move on from draft picks. 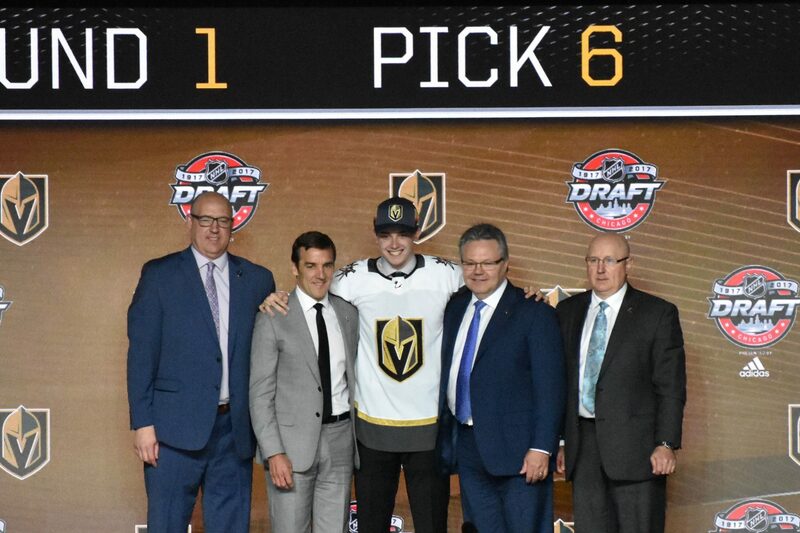 The Golden Knights currently have nine picks in the 2019 Entry Draft including two extra 3rds and two extra 5ths. Aside from the few extra picks, the Golden Knights are not exactly stocked with tradeable assets. The only true position of strength is at defenseman with Erik Brannstrom, Nic Hague, Zach Whitecloud, and Jake Bischoff all projected to be NHLers. But, it doesn’t sound like The Creator has much interest in losing any of them either. So, while history suggests McPhee will be interested in making something happen at the deadline, a bare cupboard may force him to sit on his hands. If I had to guess, I’d still expect something minor, but everyone with their eyes on the blockbuster, it may have to wait a year. Bill Foley looked tired. And indeed, he was. 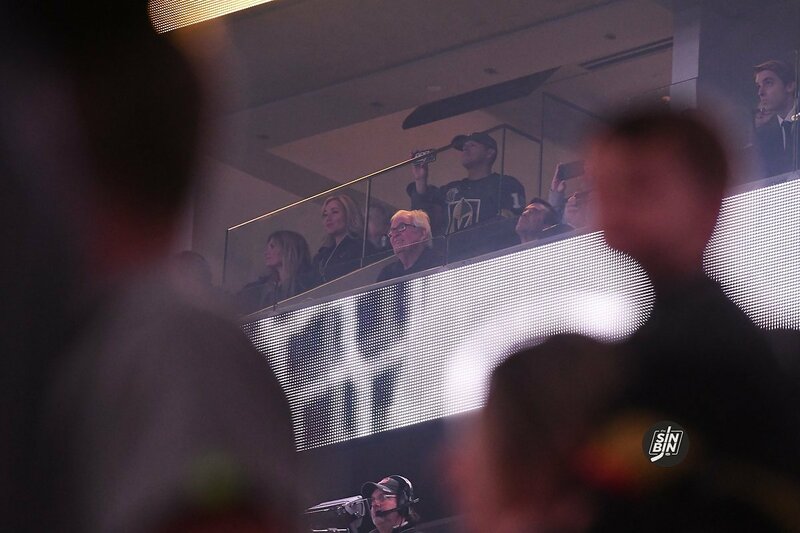 The chairman and CEO of the Golden Knights and the man who brought the NHL to Las Vegas had gotten home late from Thursday’s exhilarating 4-2 come-from-behind win over the New York Islanders at T-Mobile Arena. He was about to spend 90 minutes outside “The Arsenal” team store at City National Arena Friday afternoon, signing copies of the team’s official book that recapped its magical inaugural season. And the line was long. After all, how many fans get to meet the owner of the team they root for? But that’s what makes the man Ken refers to as “The Creator” so special. He loves interacting with the Golden Knights’ fan base. He’s so down-to-earth that even though he’s a billionaire, he can relate with those who sit in the balcony at the Fortress and who have invested more than money in this team. I found that out early on when I first interviewed Foley back in 2014. Friday, we sat down in a conference room adjacent to his office at CNA, an office, which by the way, is fairly spartan. Not a lot of memorabilia or pictures. Very simple, perhaps an ode to his West Point days in the 1960s. We talked for just over 16 minutes (you can listen to the entire audio of our conversation below) and we touched on a wide range of topics. Remember, this is a man who had to bury his son in August after 31-year-old William died. He is still grieving and he admitted he’ll never get over his loss. You can replace an injured player or a player who is under-achieving. But you cannot replace a family member who died way too early. But he said hockey and the Golden Knights have been cathartic. And for those couple of hours when the Knights are playing, he can allow himself to focus on the team and the game. Normally, this would be a regular column. But Foley had so many interesting things to say, I figured why not let you hear and read everything? 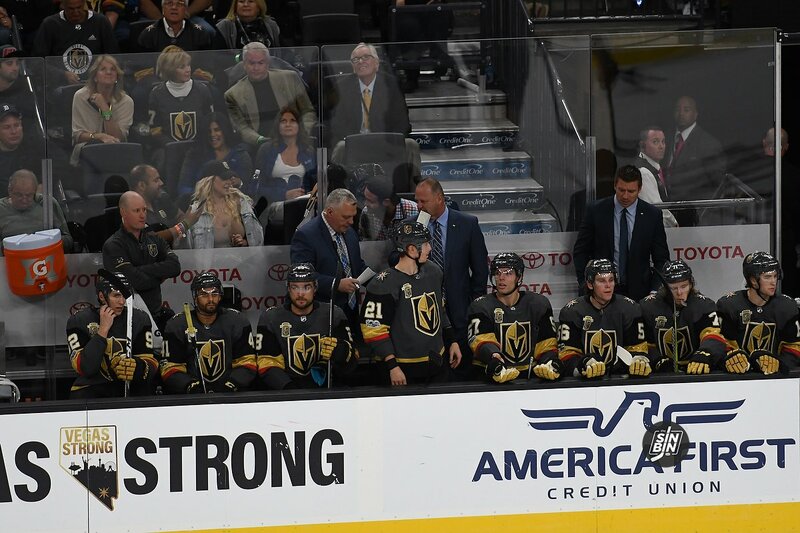 SinBin: How would you assess the state of the Golden Knights on the ice at the moment? Bill Foley: “Honestly, I believe we’re in a really good spot. We’re 22 away and now 15 at home. It’s the biggest split in the league. I think the next closest is the Avalanche who are 20 and 15. So we got through that horrendous period of five at home, 17 away. SB: Did you see that brace on his knee? It wasn’t an officially stated goal, but one of the most impressive accomplishments the Golden Knights achieved in their first season was truly becoming an NHL team. From the moment the puck dropped to the end we’re still trying to forget, there was never a feeling that the Golden Knights, or Vegas, was new to this. The building felt like an NHL arena, the fan base had the same (or more) passion as any other, and both the on and off ice products matched those of places that have been playing hockey games for decades. Sure there were quirks like the opening “show” or the drumline, but there wasn’t anything a hockey fan can pinpoint and say “that’s something only an expansion team would do.” NHL.com columnist Nick Cotsonika put it as simply, but powerfully when he told me, “it feels like this team has been here forever.” That’s a testament to the entire staff, top to bottom. However, there is one guy who is new to the NHL in every sense of the word and he’s not trying to fit in. The owner of the newest franchise might be the most hands-on owner in the entire league. He gave locker room speeches. He ate meals with the team regularly. He bought a ping pong table, a dart board, and a bubble hockey machine because he heard players mention they “needed” them. He even arranged for car washes and detailing to take place in the parking lot of City National Arena because Marc-Andre Fleury mentioned one time that he didn’t have time to clean his car. Then, when the players weren’t using it, he went military style on them in a way only an owner like him could. He’s different, in a good way. I’ve talked to plenty of players about the owner and they all seem to genuinely enjoy his style. Where most hands-on owners want to be one of the guys, The Creator actually seems to have become one of the guys. So much so that there’s a “team policy” in which calling him by the wrong name costs you a pretty penny. As they await their next destination, the Vegas media tour continues. This time, legendary PGA golfer Fred Couples chatted with two of the Golden Knights biggest contributors. Couples has followed the Golden Knights success all season and is captivated by their deep playoff run. In separate interviews with The Creator and defenseman Brayden McNabb, Freddy “Boom Boom” discussed the Western Conference finals, and of course a little golf. The Sirius PGA Radio host brought up x-factor type players and mentioned Marc-Andre Fleury and his postseason performance. Naturally, the man in charge spoke of his admiration for Fleury and made it known the goaltender is a Golden Knight for life. Every year Forbes releases a list of the most valuable franchises in the NHL. The leader, for the third straight year, is the New York Rangers coming in at $1.5 billion. For this year, the Vegas Golden Knights were simply slotted in at the price The Creator paid for the franchise, $500 million. The interesting number is the Golden Knights debt to income ratio, which is listed at 42%. Having no historical data to go off, it’s hard to determine where that number should be less than two years into existence and without a full season under their belt, but it’s certainly a number to keep our eyes on. Next year’s chart will be much more telling as Forbes will estimate the Golden Knights revenue and operating income which will shift the debt ratio. The Maple Leafs, Canadiens, and Blackhawks were the only other teams that checked in at over $1 billion. Based on the rousing success the Golden Knights have had on the ice, as well as with ticket sales, merchandise, and sponsorship, we can reasonably expect the Golden Knights to move up near the top 10 by next year. He may still have his mind on “Playoffs by three, Cup by six,” but a spot amongst the NHL’s elite in valuation is something The Creator is also dying to see. As the games tick off the schedule and the Golden Knights remain not only in the playoff chase, but in first place, no one can help themselves but to wonder how George McPhee and company will handle the roster come deadline day. The stated plan has always been “Playoffs by 3, Cup by 6” with the obvious path to achievement being through acquiring as many assets as possible now to supplement the future. However, with the current Golden Knights proving to be more capable than many expected, including the GM, it’s time to wonder how that plan will change. When asked recently, and over the course of the past few weeks, George McPhee repeats nearly word for word the exact same statement. That all sounds good and well, but we’re talking about George McPhee here. He’s an incredibly calculated man who isn’t likely to let a few games change a plan he’s had in place for about 18 months since he got the job. But there’s an elephant in the room, and in the case of the Golden Knights, he literally sits directly next to the McPhee every single game. Here at SinBin.vegas, we call him The Creator. The man who paid for the team, who coined the “Playoffs by three, Cup by six” mantra, and the man who said this recently on the Golden Knights official podcast. The guys on the Sheriff, Lawless and Some Guy Named Dave (Hashtag #SLGND of course. Can’t forget that because they remind us 47 times per episode) posed the question directly to the Golden Knights owner; do you “raise” or “fold” on trading away some of your players at the deadline? First of all, let me say I appreciate having a forum to continue to write about the Golden Knights and the NHL. Many thanks to Ken Boehlke and Jason Pothier for giving me the opportunity to connect with the followers of SinBin.vegas. And a very special thanks to the Jimmerson Law firm for sponsoring my column. You will be hearing from me twice a week — on Wednesday and on Sunday. I will also be on the SinBin podcasts and will participate in other events and promotions with Ken and Jason. Many of you are wondering what happened to me last summer. I won’t get into the exact details as to why I left the Review-Journal in early July. Let’s just say after 19 years of marriage it was time for both of us to move on. I had pursued other opportunities, both here in Las Vegas and beyond. Ultimately, I accepted a position last month to be senior editor at GamingToday, which has been around for more than 40 years and am glad to be part of the publication’s new chapter. Yes, GT deals with hockey, but from a betting perspective. And since I don’t bet on hockey, you won’t see my byline when it comes to wagering on the NHL or the Golden Knights. However, here at SinBin, you will get my observations on the Golden Knights and the NHL. It will be unfiltered. It will be unbiased. It will be fair. When the team is deserving of praise, I will be first over the boards to acknowledge it. When they are deserving of criticism, I will deal with that as well. For those not familiar with my background, here’s the Cliffs Notes version: I grew up in Brooklyn, New York as a Rangers fan. I played roller hockey, switched to ice hockey, captained my high school team and played two years of club hockey at Manhattan College before I left to pursue my Journalism degree at San Jose State. In other words, hockey has been part of me for as long as I can remember. And while you don’t have to have played the game to know the game, it doesn’t hurt to have experienced what the Knights do daily, albeit on a far lower level. I remember talking to Nate Schmidt about hockey sticks prior to last Christmas and how I used an all-wood stick throughout my career and how breaking in a pair of new skates required a lot of pain and suffering. When you’ve played, you can relate. Riding a bus. Carrying your gear. The one-of-a-kind stench that comes from sweaty equipment. You never forget. 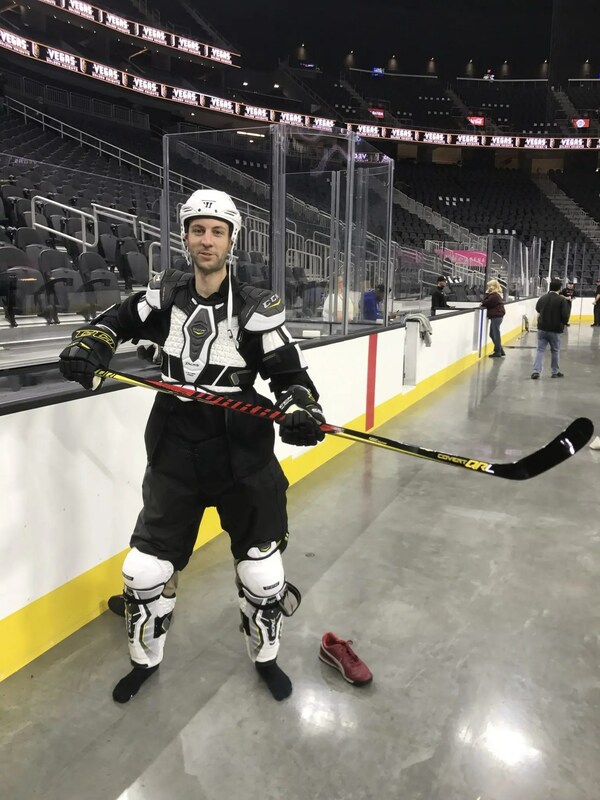 Not once last year did a Golden Knights player, coach or executive say to me, “You don’t know what the hell you’re talking about!” though I admittedly came close a couple of times with James Neal. And though I hadn’t played in a hockey game that counted in more than 40 years, I was proud of that. Once hockey gets in your blood, it stays there forever. So now that you know something about me, let me explain why I decided to write a book on the Golden Knights. Back in January as the team was having unparalleled success on the ice and in the stands playing to above capacity at T-Mobile Arena, I realized what a great story was emerging. Obviously, none of us had any idea how things would turn out, but I came to the realization that the Knights’ story could make for a great book. I had been covering the story from the start and was around the team every day. I asked owner Bill Foley what he thought and he seemed receptive to the idea. Eventually, I would ask him to do the Foreword to the book (more on that later). My leaving the R-J allowed me time to think, to write, to review the journey of the franchise, shop for a publisher and still have it come out in time for the 2018-19 NHL season. There have been three books written on the Golden Knights. The R-J and Sun came out with theirs after the Stanley Cup Final and both are photo-driven supported by copy from stories by reporters from their respective papers. A third book was written by Joe Pane, which I have not yet read. And the Knights are planning to come out with their own book — a high-end, glossy stock book in November. For starters, it is the most comprehensive work on the franchise. It is 284 pages and it goes back to the very beginning when the Maloof brothers approached NHL commissioner Gary Bettman about trying to bring a team to Las Vegas and Bettman introduced them to Bill Foley. This book also chronicles the entire inaugural season. Every game is mentioned with details and quotes from those games. It also provides insights into the players, coaches, and staff along with how the franchise and the city bonded in the aftermath of the October 1 shootings. It’s a balanced, unbiased look at the team, written in the same fashion as when I covered the Knights at the R-J. I believe it is worth your time and money and I really think you’ll enjoy it. I also hope you will enjoy my work in the coming weeks and months for SinBin. Ken and Jason truly love this sport, this team, and this city and I’m glad to be joining them in providing information and insight into the Golden Knights. Due to a series of circumstances and timing issues beyond anyone’s control, the forward did not make it into the print version of the book. However, luckily, I have a new forum to share Foley’s words, and I couldn’t think of a better way to launch my column on SinBin.vegas than with an original work from the man who brought hockey to Las Vegas, Bill Foley. 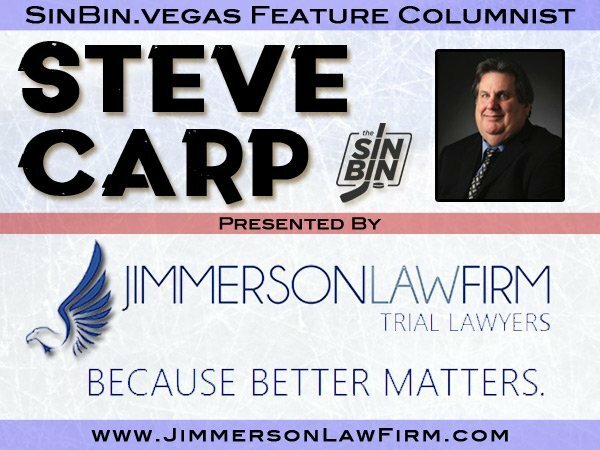 When I began pursuing an NHL franchise for the City of Las Vegas in 2014, it was an uncertain journey. There was no guarantee from anyone, and it was going to entail a lot of hard work on the part of a lot of people. Las Vegas had no major league sports franchises at the time. The city had played host to major sports events over the decades, from the National Finals Rodeo to NASCAR auto races to world championship fights in boxing and mixed martial arts. It had also hosted NHL hockey, NBA basketball and Major League Baseball. But I always believed this was a city that would support something worthwhile, especially when it came to something the people could claim to be their own. And after carefully evaluating the market over a period of time, I decided to move forward with my pursuit of bringing major league pro sports to Las Vegas. It was going to take time, a lot of money, and even more patience, the latter of which I usually don’t have great quantities of. But as I began the process, I learned that being patient was worth more than the actual money that would be spent on the endeavor. I have owned many businesses in my life, and obtaining any of those enterprises was easy compared to the process my partners and I would endure in the attempt to bring hockey to Las Vegas. It was exhaustive, to say the least, and often times frustrating. The vetting was more intense than anything I had been through. But we were ultimately successful in our quest. When I think back to the launch of our season ticket drive in February 2015 — and we had over 5,000 people commit their money on the first day to support a team that didn’t exist at the time and didn’t know if it would ever come to pass — I knew we had made the right decision. Fast-forward to the night of June 7, 2018. Who would have ever believed that a first-year franchise would be playing for the Stanley Cup? And while it was heartbreaking to have come so close only to come up short, I was brimming with pride. I was proud of our entire organization, our management, our coaches, our players. Most of all, I was proud of our fans and the city for their unyielding commitment to our franchise and our cause. Not only were they committed financially, they were totally invested emotionally. We played to over 105 percent capacity every night and we made hockey a fun event. People who had never seen a game became hooked and became some of our most ardent and loyal supporters. I always believed in the ‘Knight Culture.’ To me, knights are among the most noble of warriors. They battled with a sense of honor, a call to duty to protect and defend their community. For me, I knew if we were successful in our quest to bring the NHL to Las Vegas, I wanted the knight to be represented in our name. I believed our fans would get behind the name and concept, embrace the culture we attempted to create and be an active part of everything. And as we achieved success upon success, it dawned on me that this would make a terrific book someday. It is a truly remarkable story and one that I believe would be of interest to a wide spectrum of people. First and foremost, it would hold massive appeal to the fans of the Vegas Golden Knights, who hang on the edge of their seats through every minute of every game, people who come to watch practice at our beautiful facility, City National Arena, and who follow the team on television and radio if they can’t get to T-Mobile Arena on game night. Second, I believe this story appeals to hockey fans in general. You don’t have to root for the Golden Knights to appreciate what this team managed to accomplish in its inaugural season. It was good for the NHL and good for the sport in general. In less than a year, we have helped grow youth participation in the sport by as much as 43 percent in some areas and we are committed to growing the game in Southern Nevada at the youth level — witness our outreach program with the Clark County School District to bring hockey into the physical education curriculum for middle school boys and girls. If you love hockey and the history of the game, you will be drawn to this story. Third, this has been a remarkable sports story. No expansion team in the four major professional sports was able to accomplish what the Golden Knights did in 2017-18. You don’t need to be a hockey fan to appreciate the journey this team took and marvel at what it was able to do. Finally, this is a book that can appeal to all of Las Vegas. None of us will ever forget the horrific events of the night of October 1, 2017. It will be part of our legacy and history. But in the aftermath, we saw how sports can help a city heal, help it bond, help it rise up and unite. We had a moral obligation to be part of the city’s healing process and we continue to honor that commitment on a daily basis. If you live in Las Vegas or have visited the city and have any kind of emotional attachment to it, this story will interest you. But who should write it? I met Steve Carp back in 2014 when I visited with the Las Vegas Review-Journal’s editorial board and was sharing my vision with the editors, hoping they would throw their support behind this endeavor. I didn’t know Steve, but others had informed me of his work. He had been covering sports in Las Vegas since the summer of 1988. He knew hockey, having played it growing up in New York, and was a lifelong fan of the game. He also knew the community and the market, and we quickly formed a friendship. Over the decades, I had done hundreds of interviews with the media. But I had little to no dealings with sportswriters. I was very comfortable when I learned that Steve had been selected to cover our team, and he has been there every step of the way, chronicling the Golden Knights’ amazing story. When I learned that Steve was thinking of doing a book on our team, I couldn’t think of a better person. He witnessed the journey and as far as I’m concerned, he was the perfect person to tell our story. In addition to penning the Foreword, Bill also gave his blessing for me to use “Vegas Born” as the title for the book. As you know, the team has trademarked the phrase and after seeing what he went through with the Army and the college in upstate New York when it came to trademarks and copyrights, I didn’t want to get into a legal tussle with the team. Now, thanks to Brian Killingsworth, the team’s Chief Marketing Officer, “Vegas Born — The Remarkable Story Of The Golden Knights” is available for purchase in both The Armory at T-Mobile Arena and “The Arsenal” at City National Arena in limited quantities. I hope to have a book signing event at The Arsenal in late November or early December, preferably on a Saturday when more people can get there. If you buy the book online, bring it and I’ll sign it. If you buy it at the event, my sharpie will be at the ready. And if you happen to see me at practice or on game night and you have your copy with you, I’ll be glad to sign it right on the spot. Once the details are worked out, we’ll have them for you right here at SinBin.vegas as well as the book’s website — www.vegasbornbook.com. You can order the book from the site, sample a chapter, and check out the endorsements from some hockey media notables. And for the SinBin’s Canadian followers, we have a link to Chapters/Indigo on the book’s website so you don’t have to hunt for it. Many of you know or are familiar with Sheng Peng, the Golden Knights’ correspondent for the website, Hockey Buzz. He was around all last year and he quickly became a favorite among those of us who covered the team. Sheng has decided to leave Las Vegas and he is headed to the Bay Area where he and his wife have a home in San Francisco. His last day was Sunday when the Knights hosted Ottawa. But if you like his work and his analytic approach to writing about hockey, fret not. He will be working for “Fear The Fin,” a site dedicated to the San Jose Sharks. Sheng didn’t always endear himself to Gerard Gallant and some of the players. He saw the game through a much different lens than the rest of us. He does not have a traditional hockey background. He never played. He didn’t grow up around the game. He was more comfortable in the analytics of the sport. For Gallant and many of his players, that was a world they were and are not comfortable with. Gallant is as old-school as it gets and he grew up with newspaper guys, not websites. And he sure as hell didn’t get raised on Corsi or Fenwick and anything else like that. So he and Sheng had a Yin-Yang relationship. I only bring it up because there tends to be so much animosity between teams and the media that covers them that sometimes we don’t take the time to understand where each side is coming from. I can tell you for a fact that Sheng Peng liked the Golden Knights and liked covering hockey in Las Vegas. His critical analyses may have rubbed some people the wrong way, but he was never malicious in his reporting or writing. He’ll be the first to tell you he’s not a traditionally trained journalist, but he worked hard to build up his credibility, and while he may have ticked off some people along the way, he never did it deliberately, and he always delivered excellent work. Here’s hoping there will be smooth swimming inside the Shark Tank for a really good guy who loves the sport and goes the extra mile to promote the game with the best of intentions. Playoffs in three, Cup in six, the mantra. As a fan, you’ve got to love the optimism, no matter how unlikely you feel it may be, but have you ever wondered how George McPhee and Gerard Gallant feel about the mantra? Let’s be honest, it has to make them uneasy. Does The Creator’s wish list mean there’s an apocalypse clock on McPhee and Gallant and does “no excuses, that’s the standard,” mean the coach/GM duo have a hard deadline? Whether true or not, there’s no question every time the mantra is said publicly by the guy signing the checks, pressure has to be mounting for McPhee and Gallant. So, just how ambitious or impatient is The Creator with his future plan? After researching expansion history, “playoffs in three and Cup in six” doesn’t seem that far off for a new owner’s expectations. We can’t find any other owners publicly stating a mantra like this (let alone hundreds of times), but it appears to be a standard set decades ago. In fact, three and six would actually have been considered overly patient for many new owners. It’s a saying that shouldn’t be new to Golden Knights fans, players, and especially George McPhee, “Playoffs in three, Cup in six.” A mantra that dates back on record as far as February 2016, and one that in the mind of the man behind it probably dates back to the moment he first thought about buying an NHL team. Let me have him repeat what he said to News3’s Amber Dixon (see tweet below for video) again. Which begs two very simple questions. 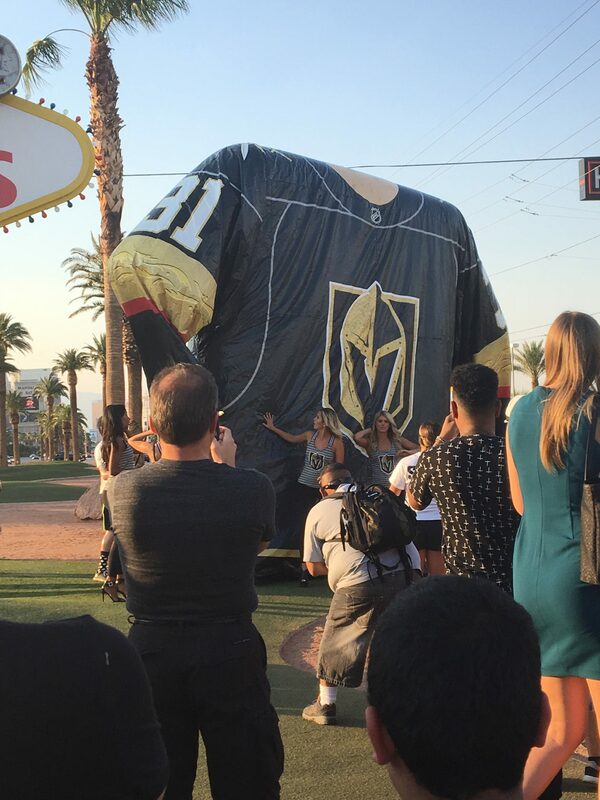 What if they aren’t in the playoffs by 2020 and what if the Stanley Cup is not being paraded down Las Vegas Boulevard in June of 2023? Only time will tell, and it’s certainly not crazy to hear the mantra and instantly disbelieve it. But this isn’t a claim coming from some fan, a player, or worse off some no-good blogger. It’s coming from a guy who simply doesn’t let things fail, and someone whose portfolio of successes isn’t exactly confined to one area of expertise like most believe. The more I talk to people, the more I realize they aren’t actually aware of who this guy is, what he’s done, and why when he says he’s going to do something, you are better off believing it than doubting it. It’s a moment Golden Knights fans have been waiting for since the moment they were told the team name. 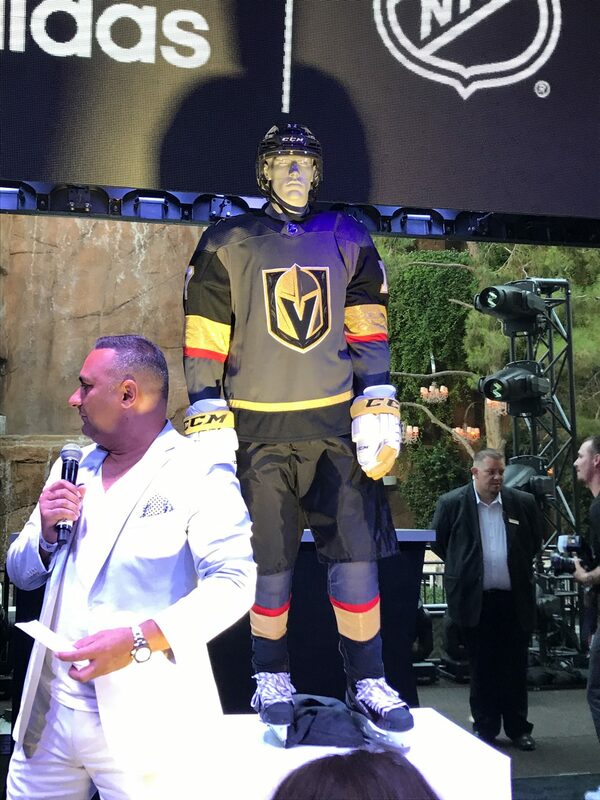 Finally, at an Adidas event at Intrigue at the Wynn, the Golden Knights revealed their jerseys for the 2017-18 season. Here are our observations followed by a bunch of photos and a few videos. The jersey looks a lot better in person than it does on the pictures. The design inside of the crest and the “rivets” are unique and certainly add to the logo on the jersey. Hopefully they keep them off the logo though. The alternate logo on the shoulders looks spectacular. The red color pops off the jersey much more when you see it with the pants and socks. On just the sweater portion, the red really gets lost. 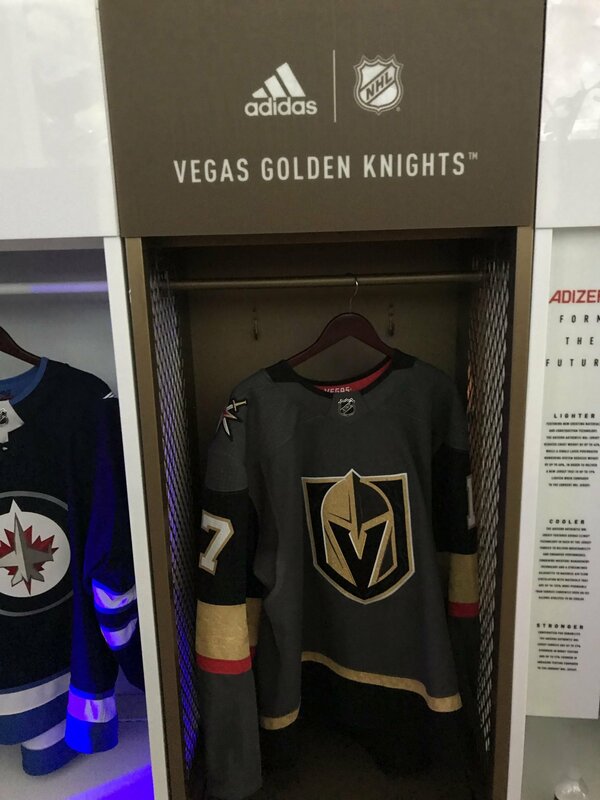 The inside of the collar with the Vegas word mark is nice. The collar is also two colors. It is black along the back and grey as it comes to the NHL logo in the front. The NHL logo is very shiny, maybe too shiny. The team gloves on the mannequin were white with gold accents. The Creator told me he doesn’t love the white gloves, that he wanted them to be all gold. An Adidas representative who works very closely with the jerseys said the gold patten cannot be replicated on gloves because it will fall apart. It’ll be interesting to see what happens when October rolls around. As for the helmet, it is black. There was a ton of chatter about it being gold, but it was seemingly vetoed by Adidas and/or the league. The Creator seemed a little disappointed when I asked him about it, but did say he likes the look of the black. Another issue is that it’s hard to replicate gold across multiple helmet manufacturers. There are up to around four different helmets players use and matching the gold to the jersey would have been “nearly impossible” as the rep told me. Remember the idea of the jerseys being a “suit of armor” and having a”chainmail” pattern. That was there in one of the original concepts, but it went away rather quickly. According to Adidas, there hasn’t been chainmail in the design for quite some time. Click through to follow our live blog of the Expansion Draft and the eight events leading up to it.